COLUMBUS, Ohio — A suggestion that started with an Ohio Catholic school student’s dream has resulted in a nationwide response of support for the birth mothers of adopted children and gratitude from the mothers themselves. The student, Olivia Oyster, is an eighth-grader at St. Mary School in Delaware. She is the oldest of three sisters — one of whom, 3-year-old Gianna, was adopted by Olivia’s parents, Greg and Stacy Oyster, after a local woman gave birth to the child. “One night in early November, I dreamed that I was in school proofreading a bunch of letters that kids at school had written to birth mothers thanking them for the courage it took to make the decision to allow their child to be adopted,” Olivia told the Catholic Times, newspaper of the Columbus Diocese. Olivia was familiar with an organization known as BraveLove, which her mother had been following on social media. BraveLove, a Dallas-based nonprofit organization founded six years ago by an adoptive mother, is not an adoption agency or a pregnancy resource center, but is primarily dedicated to advocating through media content and messaging that adoption is a loving option for those in unplanned pregnancies. It was decided Olivia would talk to the seventh- and eighth-grade classes at the school Dec. 11 and 12, show them a video from BraveLove, then ask them to write the letters. She worked with teacher Reilly Polletta on wording that everyone would use and “would be most meaningful” to the mothers, Olivia said. Polletta said she was thrilled to be involved because her youngest brother is adopted. More than 50 letters were written and sent in a package to BraveLove just before the school’s Christmas break. 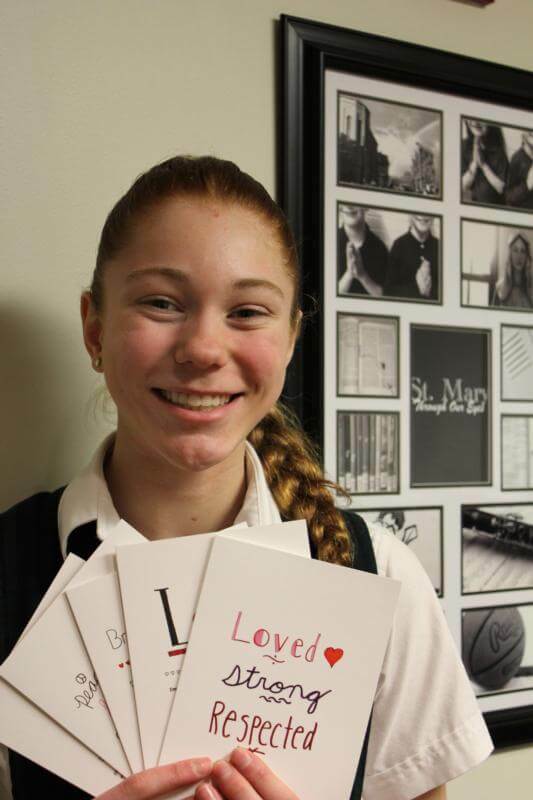 Later in January, BraveLove decided to feature several of the letters from Olivia and her classmates on a set of greeting cards it offered for sale as a Valentine’s Day promotion, which continue to be available on the website www.bravelove.org. Each card features one of the letters, plus space for the sender to add words of encouragement for the recipient. Olivia’s letter also is featured in an ongoing campaign which encourages people to send messages of encouragement on the BraveLove website so they can be seen by birth mothers and others viewing the site. BraveLove executive director Laura Bruder said the letters reached not only the birth mothers who were their intended recipients, but more than 20,000 people on Facebook alone. Olivia said she has been periodically receiving postings of 10 to 15 responses from BraveLove for the past two months. Editor’s Note: Information about BraveLove can be found at www.bravelove.org. Follow the organization (@joinbravelove) on Facebook and Instagram. To add your voice to Olivia’s efforts supporting birth mothers, go to www.bravelove.org/Olivia.